Rafters is an award winning fully self-contained first floor Cotswold holiday apartment with original exposed oak beams situated above a converted stone coach house, part of a Cotswold manor house that dates back to 1539. Rafters is an award winning fully self-contained first floor Cotswold holiday apartment with a wealth of original exposed oak beams situated above a converted stone coach house, part of a Cotswold manor house that dates back to 1539 in the picturesque Cotswold village of Broadway. Short breaks or weekly stays available all year round. Located in a superb rural setting, Rafters is just a few minutes' walk from the centre of the beautiful village of Broadway, the nearest pub and a wide range of excellent shops, galleries and restaurants. Rafters has wonderful views overlooking one of the ponds in the surrounding grounds towards Broadway Tower on top of the Cotswold escarpment in the Cotswolds Area of Outstanding Natural Beauty. Accommodation: Front door to stairs to the apartment on the first floor. Spacious vaulted sitting/dining room with original oak beams and views across the surrounding countryside towards Broadway Tower. Fully-equipped kitchen (with electric hob and fan oven). 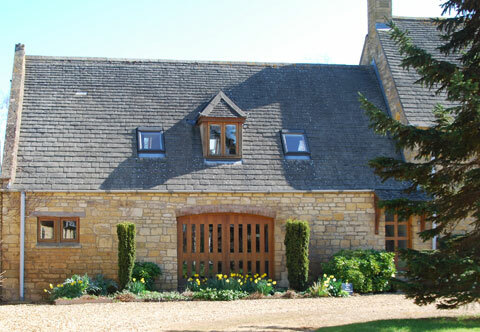 Vaulted double bedroom with oak beams and en-suite bathroom (bath with over-bath power shower). Free WiFi.